What is Flaxseed and how can it benefit me? I was faced with this question when I started hearing about Flaxseed not long ago. It became a ‘buzz word’ in society and seems to be making great role in increased health for many. I wanted to join that wagon of wellness and so I researched until I felt satisfied that it could help me, too. Here are my findings. Flaxseed contains 30-40% oil (including 36-50% alpha linolenic acid, 23-24% linoleic acid- Omega-6 fatty acids and oleic acids), mucilage (6%), protein (25%), Vitamin B group, lecithin, selenium, calcium, folate, magnesium, zinc, iron, carotene, sulfur, potassium, phosphorous, manganese, silicon, copper, nickel, molybdenum, chromium, and cobalt, vitamins A and E and all essential amino acids. Other fatty acids, omega-6’s, is abundant in vegetable oils such as corn, soybean, safflower, and sunflower oils as well as in the many processed foods made from these oils. Omega-6 fatty acids have stimulating, irritating and inflammatory effect while omega-3 fatty acids have calming and soothing effect on our body. Our bodies function best when our diets contain a well-balanced ratio of these fatty acids, meaning 1:1 to 4:1 of omega-6 and omega-3. But we typically eat 10 to 30 times more omega-6’s than omega-3’s, which is a prescription for trouble. This imbalance puts us at greater risk for a number of serious illnesses, including heart disease, cancer, stroke, and arthritis. As the most abundant plant source of omega-3 fatty acids, flaxseed helps restore balance and lets omega-3’s do what they’re best at: balancing the immune system, decreasing inflammation, and lowering some of the risk factors for heart disease. One way that Omega 3 essential fatty acid known as Alpha Linolenic Acid ALA helps the heart is by decreasing the ability of platelets to clump together. Flax seed helps to lower high blood pressure, clears clogged coronaries, lowers high blood cholesterol, bad LDL cholesterol and triglyceride levels and raises good HDL cholesterol. It can relieve the symptoms of Diabetes Mellitus. It lowers blood sugar level. Flaxseed help fight obesity. 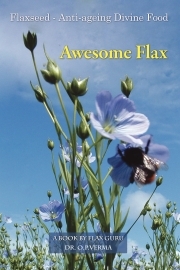 Adding flaxseed to foods creates a feeling of satiation. Furthermore, flaxseed stokes the metabolic processes in our cells. Much like a furnace, once stoked, the cells generate more heat and burn calories. Flaxseeds are the most abundant source of lignans. Lignans are plant-based compounds that can block estrogen activity in cells, reducing the risk of Breast, Uterus, Colon and Prostate cancers. According to the US Department of Agriculture, flaxseed contains 27 identifiable cancer preventative compounds. Lignans in flaxseeds are 200 to 800 times more than any other lignan source. Lignans are phytoestrogens, meaning that they are similar to but weaker than the estrogen that a woman’s body produces naturally. Therefore, they may also help alleviate menopausal discomforts such as hot flashes and vaginal dryness. They are also antibacterial, antifungal, and antiviral. Because they are high in dietary fiber, ground flaxseeds can help ease the passage of stools and thus relieve constipation, hemorrhoids and diverticular disease. Taken for inflammatory bowel disease, flaxseed can help to calm inflammation and repair any intestinal tract damage. Misc. Awards in Drawing and Painting, Photography, Writing, Poetry etc. Publication of Booklets and Books including Alsi Mahima and others. Two Flax Awareness Journeys in 2010 and 2011 in different cities of M.P. and Rajasthan Total 7000 Km.